I can't seem to shake this flu like virus off which is driving me crazy & what is really concerning me is I am being actually having to be quiet for a change as even talking hurts lol. I haven't had the energy to put my Christmas trees up yet which is so unlike me. I'm one who always has the house decorated for Christmas on the 1st December every year, and what with my lack of Christmas spirit as well at the moment I'm scared I'm turning into The Grinch lol. This week I have used a stamp I'd forgotten I had, I love little surprises like that it's like having new stash all over again without the trauma of paying for it lol. 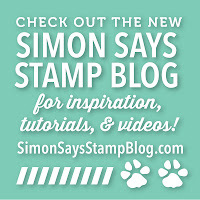 I usually use glitter snow when playing with Simon's Christmas stencils, but on this card I thought I'd try painting Gesso on the stencil over Core'Dinations whitewash cardstock and I love the soft & textured look it gives. I really hope my post makes sense as I'm so tired I can't even think straight and I'm fighting to keep my eyes open, I really need my nice big comfy bed and a bar of chocolate of course lol. Oh, Mandy, this is so beautiful! Love the pink for a Christmas card and your wonderful layers and texture take this over the top! Feel better soon! Absolutely delightful. So love the pinks and flower spray. So gorgeous, Mandy! 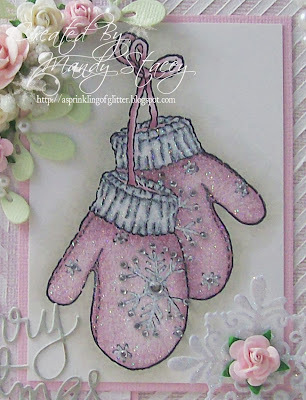 I love all the detail and especially those sparkly mittens! 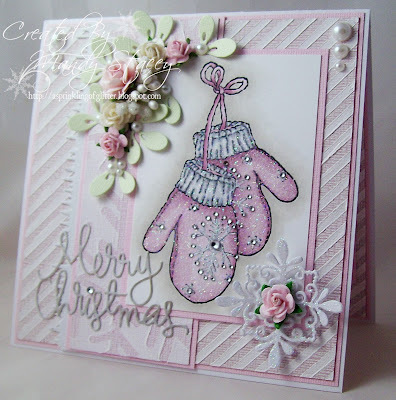 Love your gorgeous and adorable card and that mitten stamp is beautiful. 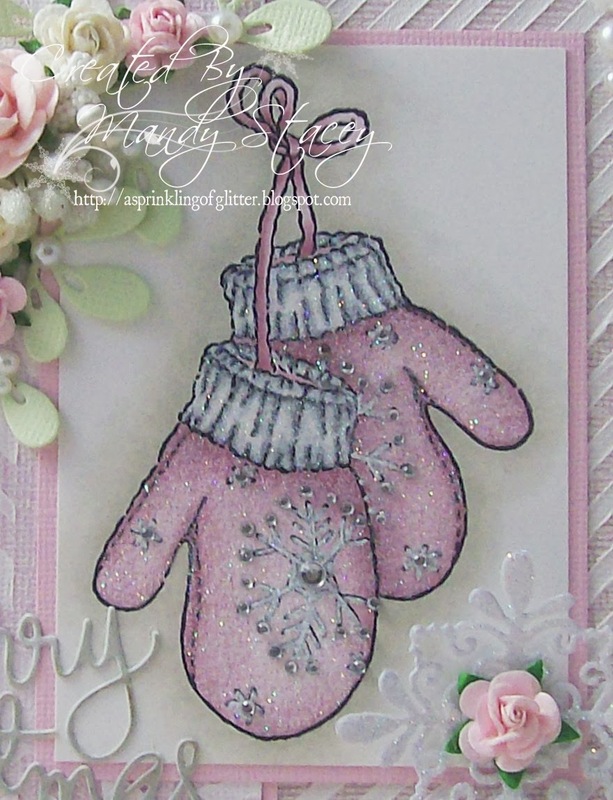 A gorgeous card Mandy, such pretty colours and I just love those mittens!!! 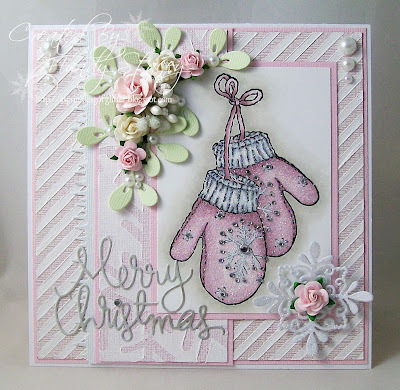 Gorgeous card, I love the soft colors and the flower arrangement. I saw it on MIM and it is definitely worth the closer look. I love this card. The mittens are adorable. 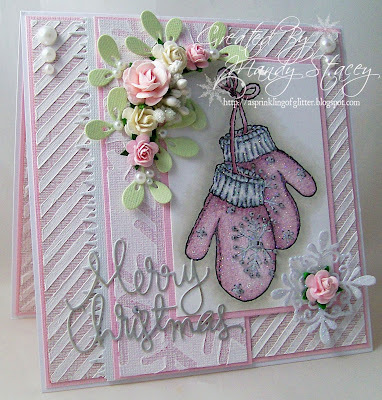 Very pretty card Mandy, I love the colours you used and your background is lovely too !